According to the Las Vegas Review-Journal, Oakland Raiders cornerback Sean Smith says he is healthy. Smith is coming off a shoulder surgery. 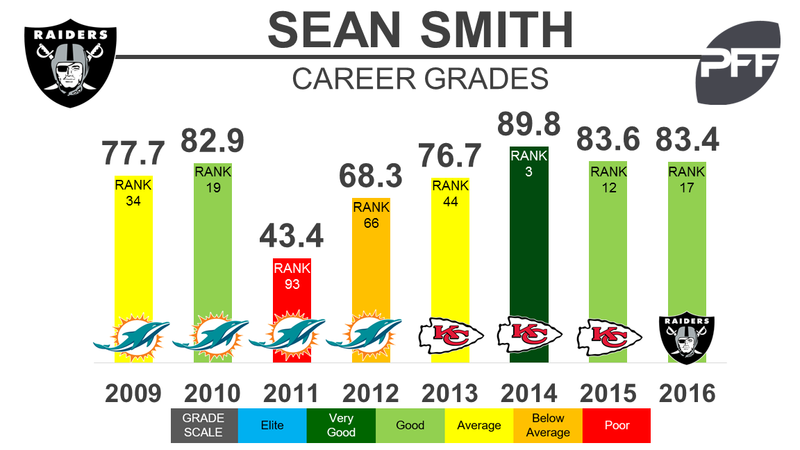 Health hasn’t been much of a concern for Smith throughout his career, as he has played at least 900 snaps in seven of his eight seasons as a pro. Despite early-season struggles in 2016, Smith still put together a good year. His 83.4 overall grade ranked 17th out of 111 corners. Smith has been one of the most consistent corners in the NFL and has now ranked inside the top-20 at his position for three consecutive seasons including a career-best 2014 in which he ranked third among corners (89.8).